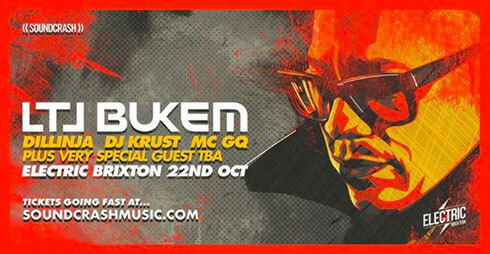 A show from LTJ Bukem, is taking place at Electric Brixton on Saturday 22 October. Joining him for possibly the biggest underground D&B night of the year are Dillinja, DJ Krust and MC GQ plus a special guest to be announced. LTJ Bukem probably needs no introduction to D&B heads, as he is apparently one of the founding fathers of the scene. His classical music training in his teenage years has always come to the fore in his productions, with his jazz fusion and funk influences allowing him to pioneer and nurture new directions within the genre through his label, Good Looking. Along with his production, his experience in live productions through his number of club nights including Speed with DJ Fabio have helped increase his status. To add to proceedings, Dillinja, creator of The Valve Soundsystem, will be bringing his combination of dirty basslines and beats. He has worked with David Bowie to Bjork and Basement Jaxx and is well known. Founder of Full Cycle Records with Roni Size, Bristol's DJ Krust will be gracing the decks with his archive of classics as well as new beats. This was witnessed at the apparently sold out Full Cycle Records show at Village Underground earlier this year. Hosting the night will be MC GQ, who has continued to MC for 25 years. His versatility is such that he has always been able to switch up to double time and tear down a rave, or keep the crowd bubbling to a liquid set. Hi there, its fastidious article on the topic of media print, we all know media is a wonderful source of information. Hi! I've been following your website for a while now and finally got the bravery to go ahead and give you a shout out from Atascocita Tx! Just wanted to say keep up the excellent work!